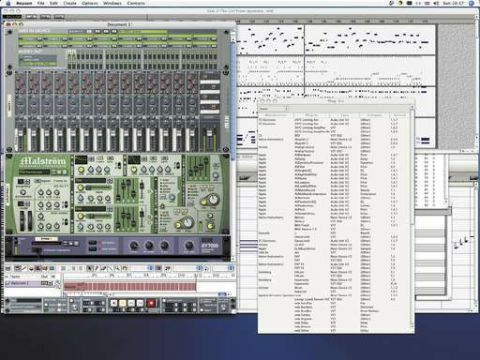 A capable sequencing package takes some mastering, as any seasoned user of Cubase, Logic or Live will attest. Hence it's unlikely that those in the know will dump their music-making tools at the mention of a new version of Sagan's Metro audio/ MIDI sequencer. However, existing Metro users, and those looking for an inexpensive step up from beginner-friendly packages such as GarageBand, have a lot to look forward to. Metro is a high-powered sequencer capable of handling MIDI, 64 tracks of audio recording and playback, and up to 99 tracks of video, all in a similar fashion to that of sequencers costing twice its price. It accommodates a system-limited number of AU and VST plug-ins and is ReWire- compatible, so it's expandable, and has extensive automation, routing and audio-processing facilities, so it's flexible. The interface isn't as pretty as those of Logic Pro and Cubase SX, but as a music-production tool, Metro 6 works and works well. Upgraders to v6.3.6, for which there's a variety of deals at the Sagan website, can expect the usual raft of bug fixes, as well as new features, including the facility to assign multiple mixer channels to a single plug-in, and those plug-ins with multiple outs can have their outputs assigned to multiple faders, which makes for finer control over the mix.